Halloween is drawing nearer and so are the many parties or “horror-nights” organised by friends, family or oneself. Spooky costumes, the creepy atmosphere, the bloody movies – all of these things are quite quickly organised and prepared. The question that remains is the one about food. Just like you might have been wondering what to cook and serve on ‘all hallow’s eve’, I have been wondering about what recipe to present you this time. A soup again? Sweet cupcakes (again)? Party food or a real three course menu? I couldn’t decide… So what I’m going to do is simply presenting you a smallish range of different things all of them related with Halloween – and some of them uncannily lovely! What I have for you today: Ghostly Strawberries, Monstrous CakePops, Chocolate Mousse Graves, Pumpkin Pudding Ghosts, Brain Cupcakes, Shrunken Heads in Cider, Frankenstein’s Monster(!) Marshmallow Pops and a Chocolate Fudge Cake with Ghost Meringues. The important criteria for me was that the food looked halloweenish but not unappetizing. Anything that looks like real cut-off fingers, decayed eyeballs or puke will not enter my kitchen let alone be made by my hands. No way! So these treats are more or less cute but still rather eerie. These aren’t my recipes (except for one), that’s why this post is going to be rather a “link”-collection telling you where to get inspired than a collection my masterpiece-recipes. Some of the recipes I’ve tried, some are new to me too. Nevertheless, they are all inspiring. Break the dark chocolate into more or less small pieces and melt in a bowl over boiling water. Add the milk and mix well. Remove from the heat and whisk in the egg yolk. Allow to cool. In a bowl, whisk the egg whites, adding the sugar little by little. Add a quarter of the egg whites tothe chocolate, and then whisk briefly. Carefully fold in the remaining egg whites. Pour into 4 glasses and chill for several hours. ->a note of mine: You can get some more inspiration here. -> a note of mine: Add cute name tags reading “Sir Thanks-A-Lot”, “Albert Mindstein”, “Smar T. Pants” or “Intell E. Gent” for fun! If you don’t feel like having a brainy cupcake decoration, you may try the simpler variation with the Tim Burton inspired faces (just paint faces on the butter cream with melted chocolate). I really hope you enjoyed this edible excursion into Halloween. 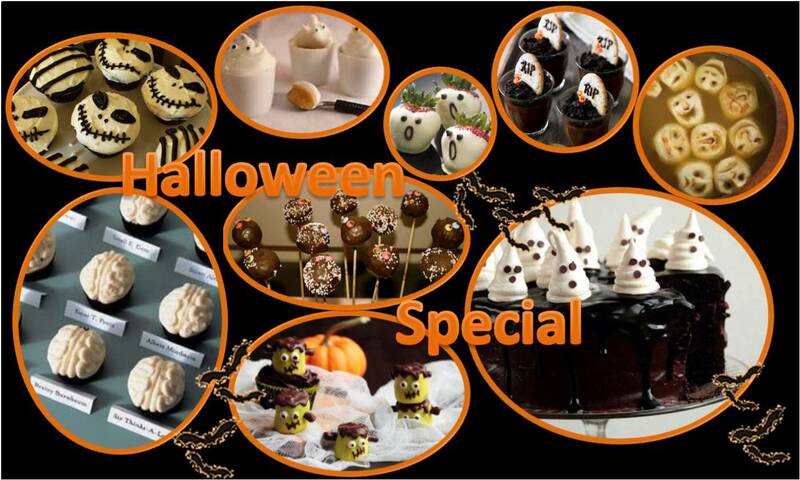 Have fun trying these treats for the upcoming, scary evenings!